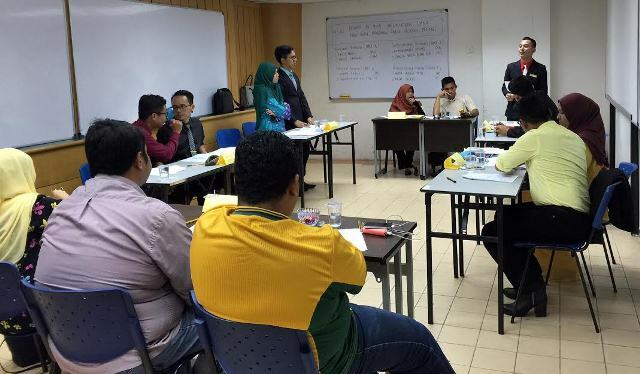 WEDNESDAY, 24 FEBRUARY – A total of four debaters from Universiti Malaysia Sabah (UMS) showed great potential at the Peace Debate 2016 that recently took place at Universiti Pertahanan Nasional Malaysia (UPNM), Kuala Lumpur. Sharing the same concept as the British parliament debate, UMS was represented by two groups UMS A comprising of Mohd Faisal Abd Roup and Mohd Fazrul Abd Rahim, whilst Team B was represented by Nur Medina Khairul Anuar and Kuan Yen Hong. Mohd Faisal and Mohd Fazrul were eliminated in the semi-final but the experience of going through five earlier rounds in the pre-quarter had given an invaluable experience to both. According to Mohd Faisal who were crowned Royal Best Debater 2014, UMS team would continue to work towards making UMS a team to be reckoned with in this country. “The coaches will provide us with greater focus for the upcoming two most prestigious debating competition namely Royal Debate and Environmental Debate,” he said, adding that UMS debate teams were trained by the Deputy Director of the Centre for Strategic and Academic Management UMS, Associate Professor Dr. Ramzah Dambul and UMS alumni, Mohd Qhairol Iqhssan. For UMS Woman debater, Nur Medina Khairul Anuar, the support given by the university to students, especially those in public speaking would produce graduates with added value and able to assess an issue with more rational.